MERCATOR, G. / HONDIUS, J. - Scotiae regnum. Scotiae regnum. - MERCATOR, G. / HONDIUS, J. Size : 21.5 x 18.0 inches. / 54.5 x 45.7 cm. 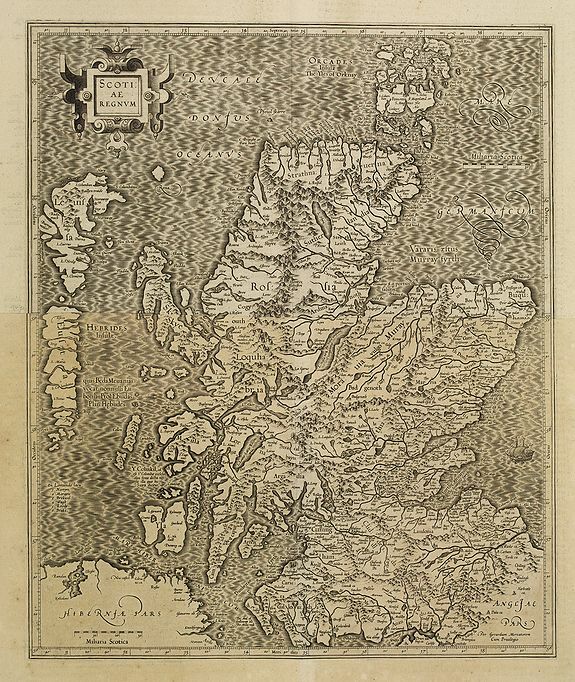 Description :Detailed map of Scotland, made of 2 maps pasted together. Mercator was born in Rupelmonde in Flanders and studied in Louvain under Gemma Frisius, Dutch writer, astronomer and mathematician. The excellence of his work brought him the patronage of Charles V, but in spite of his favor with the Emperor he was caught up in the persecution of Lutheran protestants and charged with heresy, fortunately without serious consequences. No doubt the fear of further persecution influenced his move in 1552 to Duisburg, where he continued the production of maps, globes and instruments. Condition : Two joined sheets. A good and strong impression. Paper age-toned. Altogether in very good condition.